Jewish socialist and nationalist; born at Bonn June 21, 1812; died in Paris April 6, 1875; buried in the Jewish cemetery at Cologne. His grandfather, who had come from Poland, instructed him in Bible and Talmud, but on the whole he was a self-taught man, having never attended any institution of learning, nor received a thorough technical or professional education of any kind. However, he began his literary activity at an early age, and became editor of the "Neue Rheinische Zeitung." Originally a National-Liberal, he became a Democrat, and later a Social-Democrat, joining Marx and Engels. Together with Karl Grün he exerted about the middle of the last century an important anarchistic influence in Germany by developing and disseminating Proudhon's theories, both with his pen and from the platform. Though he had already turned his back upon Judaism, the Damascus affair reawakened his interest in Jewish matters, and he conceived the idea of the indestructibility of Jewish nationality. He intended to give form to this idea in a "cry of anguish"; but, as he himself says, the stronger feelings aroused by the sufferings of the European proletariat threw his racial patriotism into the background. However, he found little sympathy among his fellow socialists. Shortly after the February Revolution of 1848 he went to France, and soon afterward retired from politics to devote himself exclusively to natural science. The neo-Hegelian Arnold Ruge called him ironically the "communist Rabbi Moses." Berthold Auerbach and Gabriel Riesser, on whose departure from Frankfort he wrote a graceful poem (Brüll, "Monatsblätter," xii. 272), were among his friends. As early as the sixties of the last century, David Gordon (editor of "Ha-Maggid") at Lyck, Hirsch Kalischer at Thorn, and Elijah Guttmacher advocated the colonization of Palestine, and interested Moses Hess and the historian Grätz in the idea of Jewish nationalism. Hess's first work was his "Heilige Geschichte der Menschheit von einem Jünger Spinoza's" (1836). Shortly before his death, which came upon him in the full maturity of his powers, he published a philosophic work, in three volumes, entitled "Die Dynamische Stofilehre." His chief work, however, is "Rom und Jerusalem, die Letzte Nationalitätsfrage" (Leipsic, 1862), in the form of twelve letters addressed to a lady pondering, in her grief at the loss of a relative, over the problem of resurrection. Part of this work has been translated into Hebrew by S. I. Hurwitz in "Ha-Maggid," xxxii., Nos. 26, 27, 32, 35, 36; xxxiii., Nos. 8, 9, 11, 13. A second edition was issued by Bodenheimer (Leipsic, 1899), with a preface; in 1899 this preface reappeared in "Die Welt," iii., No. 43, p. 13. Following are the leading ideas in Moses Hess's work: (1) The Jews will always remain strangers among the European peoples, who may emancipate them for reasons of humanity and justice, but will never respect them so long as the Jews place their own great national memories in the background and hold to the principle, "Ubi bene, ibi patria." (2) The Jewish type is indestructible, and Jewish national feeling can not be uprooted, although the German Jews, for the sake of a wider and more general emancipation, persuade themselves and others to the contrary. (3) If the emancipation of the Jews is irreconcilable with Jewish nationality, the Jews must sacrifice emancipation to nationality. Hess considers that the only solution of the Jewish question lies in the colonization of Palestine. He confidently hopes that France will aid the Jews in founding colonies extending from Suez to Jerusalem, and from the banks of the Jordan to the coast of the Mediterranean. He draws attention to the fact that such a proposition had already been made to the French government by Ernest Laharanne in "The New Oriental Question," which he cites. "Rom und Jerusalem," however, met with a cold reception (comp. "Ben Chananja," 1862; "Zion," 1897, No. 3; "Jüdischer Volkskalender," 1902; "Monatsschrift," xi. 317 et seq., 354 et seq.). Nevertheless, it became one of the basic works of Zionism. Hess was one of the most zealous and gifted opponents of the Reform movement. While he himself regarded religious evolution as necessary, he held that it must come by the power of the living idea of Jewish nationality and its historical cult. 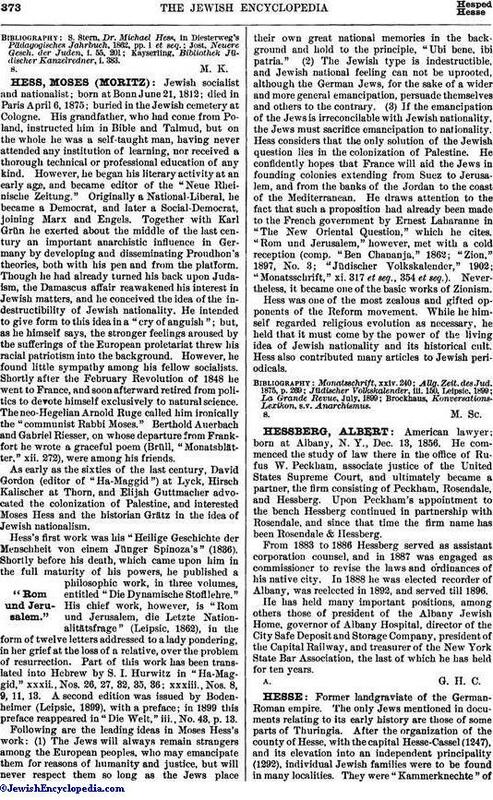 Hess also contributed many articles to Jewish periodicals.